Next time you fry a stack of pancakes, imagine what it would be like if your life and the well-being of your children depended on it. In the spring of 1874, Kate Polly and her husband Ephraim lived with their young daughters, two-year-old Katie and four-year-old Annie, in a dugout at the headwaters of Morgan Creek in what is now Hemphill County. They had been among the first Anglo families to settle on the High Plains. Back then, the Panhandle had yet to see a plow, its sweeping, treeless plains covered in luxuriant native grasses and vast herds of buffalo and antelope. A person could see for miles in any direction. And one morning early that summer, bad trouble loomed on the horizon. Home alone with the children, Kate busied herself with her daily chores. Her husband, who had been a hospital steward in the Army, had left to tend to a sick buffalo hunter and then gather forage to sell to the military at Camp Supply in Oklahoma. At some point Kate happened to look outside and saw something not everyone lived to describe: Hundreds of horseback Indians, all armed with either bows or rifles, quietly encircling their dugout. With gestures underscored by bruising pinches, the Indian’s headman communicated that he and the other Indians wanted food. Sizing up their number, Kate decided the easiest meal would be pancakes. After lighting a fire in her wood-burning stove, she donned her apron and started mixing batter. Whenever Kate had to stop and mix more batter, the next Indian in line would pinch her and motion for her to start cooking again. Finally, near sundown, the family’s 192-pound flour barrel ran empty. Exhausted, Kate picked up her youngest child and went outside, plopping down on a cottonwood log. Oblivious to the watching Indians, she opened her blouse and began nursing her daughter. Seeing that their meal service had stopped, several of the Indians came up and pinched her again, pointing toward their stomachs and the dugout. They wanted more pancakes. Dead tired, Kate shook her head and ran her finger across her throat in a universally understood gesture. She had been standing over a hot stove all day long, flipping hotcakes for hundreds of hostile Indians. If they wanted to kill her now, fine. At least she wouldn’t have to wash the dishes. Impressed by her pluck as well as with her cooking, the Indians mounted their horses, rounded up the Polly family’s milk cows and rode off through a canyon to the northwest. The cows later wandered back, but not the Indians. From Morgan Creek, the war party rode on to a buffalo hunter’s camp at a place called Adobe Walls in what is now Hutchinson County. At dawn on June 27, they attacked. Aided by Billy Dixon’s famous mile-long shot that toppled the Indian’s medicine man from his horse, the buffalo hunters managed to hold off the warriors and all but two of the defenders lived to tell about it. The incident triggered the Red River War, the last stand of the Plains Indians in the Panhandle. When Ephraim returned from his trip, he found the dugout surrounded by unshod pony tracks and estimated as many as 700 Indians had descended on the place in his absence. He reckoned them to have been a mix of Comanche, Kiowa and Cheyenne. When the U.S. cavalry marched into the Panhandle to deal with the hostile Indians, the Pollys moved back to Fort Hays in Kansas, which is where they had come from. They returned to Texas in at the end of the war in 1876 and operated a stagecoach stop on Commission Creek (in present Lipscomb County south of what would become Higgins) along the road from Dodge City, Ks. to newly established Fort Elliott near Mobeetie in Wheeler County. 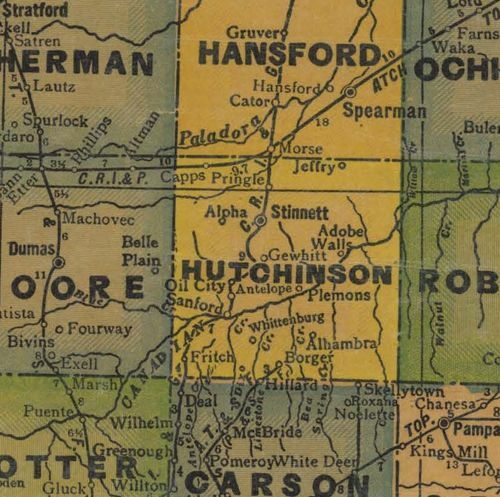 The Pollys stayed there until 1885, when they returned to Hemphill County. When that county was organized two years later, Ephraim got elected as the first county judge. Hemphill County is where the couple stayed for the rest of their lives. Kate died at 57 on May 2, 1899 and was buried in Canadian. Her husband joined her in the same cemetery after his death on April 21, 1905. He had made it to 63. Fortunately, the story of Kate’s 1874 pancake dinner did not die with the pioneer couple. Kate’s oldest daughter, by then Mrs. D.M. Hargrave, had been just old enough to remember the incident and passed the tale on to her daughter, the future Mrs. E.R. Cloyd. Mrs. Cloyd, in turn, put the story on paper for inclusion in a history of Lipscomb County published in 1976. Whether Kate Polly could ever stomach cooking pancakes again is not recorded, but given her grit, she probably did. After all, flapjacks saved her scalp and probably averted a life of captivity for her children.